No. It does not hurt the dog. Some might not like it, but it is not painful when done properly. Wire hair is not attached like our own hair or breeds with other types of coats. Many dogs even enjoy it. For pet dogs I do clip or scissor the tender spots so it isn’t uncomfortable for them. There are also many mixed breeds that look marvelous when hand-stripped, or even partially hand-stripped to bring out their natural wire coat. Hand stripping maintains a proper wire coat, while clipping makes it soft and ruins the texture. Without the outer wire coat, the coat colour will change and fade out. Each individual wire hair has a hard wire point, then is semi hollow down to about the undercoat level. It is very soft at the base and only lightly anchored in the follicle which is why they pull out easily. Cutting the hair takes away the structure of that hair. This is particularly true when cut below the undercoat level, but even just cutting off the tip breaks the structure. If cut, the soft base stays in the follicle so a new wire tipped hair does not grow. The soft bottom will continue to grow awhile. 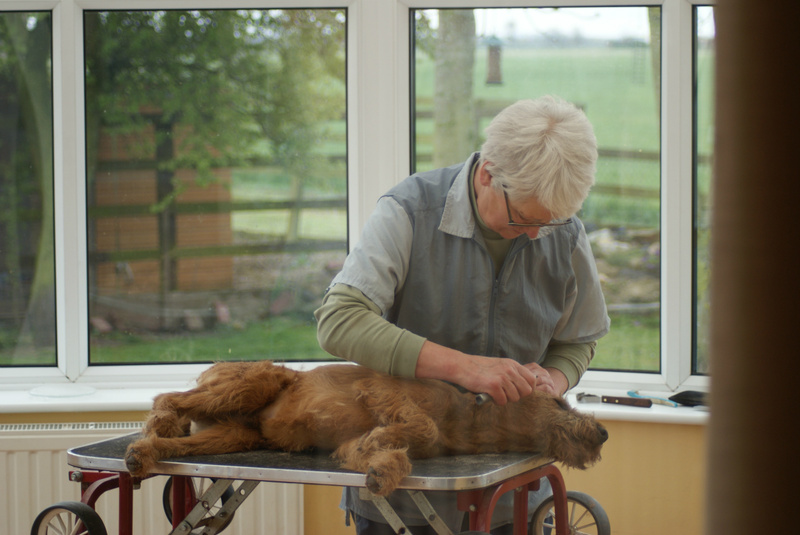 If the dog is continually cut, the coat stays super soft as the soft downy under coat and the soft base of the wire hair from the old top coat is all that is seen. Often they end up with a ‘cottony’ coat and sometimes black hair turns to grayish blue or brown. Absolutely, if it important to you to maintain the proper breed look. It is very hard to imitate that look on many wire coated breeds if you clip them. However it will do no real harm for pets to be clipped if you do not care about that look. Yes, but sometimes it can be difficult if a dog’s coat has been clipped many times. You often have to let them grow out several months and strip them several times to get the wire coat growing properly again. Sometimes after only one clipping it comes back fine but do not count on it. The longer amount of time the coat has been clipped, the more months it will take with diligent stripping to get the coat back to it’s original correct texture. But it can be done in most cases! If clipped is there any way to help keep the coat hard? If you must clip, hand strip a little before and use a pumice stone afterwards weekly to ‘brush’ them, this takes out some of the cut dead coat to try to stimulate some new hairs to grow. Other coarse coated breeds like the Bouvier are also hand stripped. Many other coats are maintained with stripping or carding, sometimes combined with using thinning shears, instead of clipping the hair, from the ‘saddle’ on the Afghan Hound to English Cocker Spaniel backs, for example. And then there’s many mixed breeds that have a wire-haired coat that can look marvelous hand-stripped. Many do not, since it is time-consuming and very labour intensive. Question the groomers in your area. Often if they do not do hand stripping themselves, they will know of another groomer who does. Be sure to tell the Pet Groomers that you want your dog plucked or hand stripped. ***Make sure that they understand what you mean by “stripping.” Among pet groomers, to ‘strip’ a dog means to shave it down to the skin. !”*** So ‘a strip’ is VERY different from ‘Hand Stripping! !’ Expect to pay a lot more–at least double–what the clipping price would be. It is very labour intensive. Eek! You said my dog would have a nice wire coat. I had my dog hand stripped and now she looks naked and is very soft. How long will it take to grow back? Often the wire coat is in one layer and pulling it leaves them in their “underwear” (the thinner, softer undercoat) until a new wire coat comes though. It may take 8 to 10 weeks before the new wire coat comes in and is long enough to cover the undercoat. Do you have to strip to the undercoat? Is there a way to have a nice wire coat when the are freshly hand stripped? Sometimes you have to strip down to the undercoat, in particular when they are pretty long. This is because all of the wire coat is one length and ready to come out. But sometimes the coat is in layers, either produced by ‘rolling’ the coat or new coat coming in from natural shedding. This often means bringing the dog in more often to have the coat rolled rather than completely stripped. OK….. What is rolling a coat? It’s really the same thing. For the purists, stripping is all done by hand, but many groomers use a stripping knife. It all gets the same results! Is Knife or ‘hands only’ stripping better? If a stripping knife is used properly, it works as well as pulling the coat only with fingers. Despite the name ‘knife,’ it is never used to cut the hair, only to help grip it. Only if the knives are too sharp or the wrong motion is used is the dog’s hair cut. My groomer said she would also ‘rake’ my dog’s coat and I should do this at home too. What does that mean? Take your dog to a groomer who does hand stripping. They’ll be able to tell just by looking at the coat and touching it whether it’s time or not. If it is not quite ready, they’ll be able to tell you when to make the appointment to have your dog stripped at the proper time. Whether your Irish is a companion dog, or you wish to show him/her, frequent grooming is essential for the health of the dog and to keep him tidy in appearance. Grooming should start from the time your puppy comes home. In the early stages it will be simply getting them used to gentle brushing as part of the normal socialising and play time, handling his feet, ears and teeth and cleaning eyes so that this become part of normal home life. Later it should become more serious introducing him to regular standing on a table, a table or raised surface that is solid so he doesn't feel unstable, and one that is a comfortable height for you to reach all round them. A grooming stand will also assist in keeping them in position so that you have two hands free to work. Grooming on the floor is not a good idea for anything other than simple tidying. The Irish Terrier has a unique coat. The tip of each hair is a deep shade of red, the main part of its shaft is wheaten lightening towards the root. Hence the initial coat appears quite dark and lightens as it grows long. The best coats are wiry growing flat and close to the body and as they go past their peak, or 'blow', they become wavy or take on a broken appearance. At the base of the outer coat is a softer undercoat, revealed when the outer coat is parted, that provides water-proofing and protects from excessive heat or cold. The 'companion' Irish should be stripped twice per year, spring and autumn. This removes dead and blown hair allowing a new coat to grow through. The stripping process involves pulling out the dead hair and, apart from local detail work, should never involve cutting as this only removes the surface coat leaving behind dead and soft, paler hair. Hand stripping is time consuming and, if done by a professional, is necessarily expensive. The technique is not difficult with the advantage that any hair pulled out by mistake quickly grows back. It need not be expensive to purchase equipment to trim your Irish Terrier, the lower priced Magnet knife is a good one to start with moving to the more expensive, long lasting, Mars knife as experience grows. Whatever knife is used the edge should be dulled before use to reduce the risk of cutting. The basic technique is known as 'finger and thumb' since the hairs were gripped between them and pulled out in the direction they lie. Start by pulling just a straggly hair or two. For a full strip the knife is a useful assistant. Lay the knife almost parallel to the body, curl the hair over the serrated edge, grip with the thumb and pull in the direction it is growing. The hand that is not holding the knife should press down on the skin just above where the hair is growing. Again try a little at a time until the technique is mastered.